If you think you may have bronchitis or pneumonia FastMed can help. With over 70 locations in North Carolina and Arizona, it is easy to find a clinic near you. When determining whether you have bronchitis or pneumonia it is helpful to know the cause and symptoms of each. Bronchitis is a condition in which your bronchial tubes become inflamed and irritated. This can cause a cough that brings up mucus, wheezing, chest pain, a low fever, and shortness of breath. There are two types of bronchitis, acute (short-term) and chronic (long-lasting). Pneumonia is an infection in one or both of your lungs that causes air sacs in the lungs to become inflamed. They may even fill up with fluid or pus, causing you to cough. Other symptoms may include fever, chills, and difficulty breathing. 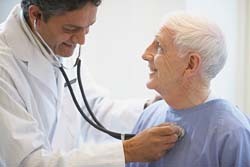 Pneumonia can range from mild to severe, and tends to be more serious in young children and adults over 65. The qualified medical professionals at FastMed may use a stethoscope to listen for wheezing or other abnormal sounds in your lungs, which might indicate bronchitis. He or she also may take chest x-rays or perform bloodwork to see if you have pneumonia. Our state-of-the-art walk-in clinics are equipped with digital x-rays and have on-site labs so we can deliver your results in-house, quickly. FastMed clinics open early and close late, and our goal is to get you in and out within an hour. We aim to provide fast, convenient, and cost saving service when you are facing a non-life threatening injury or illness. Click here to view our locations or learn more.